Much of the research and discussion about drugs and the internet has focused upon either buying drugs online or seeking drug-related information online. News coverage has particularly focused upon the capacity to buy drugs from web vendors (eg, Psychedelic drugs just a click away online, Deadly drug on the net).Yet, evidence from the last decade indicates that most drug transactions still occur in the traditional way. 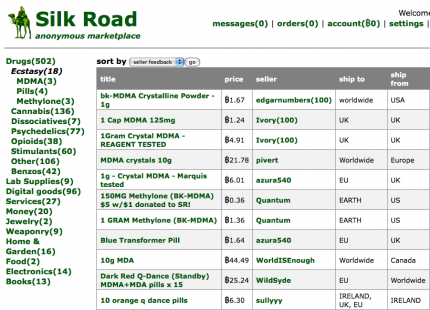 Popular illegal drugs are not generally available online: unless the product can be marketed as ‘legal’ or ‘not for human consumption’, the legal risk and practical problems associated with selling heroin, MDMA, amphetamines, and cannabis through an online marketplace are just too big, for both buyers and sellers. Yet, evidence from the last decade indicates that most drug transactions still occur in the traditional way. It’s not that the demand doesn’t exist for online drug vendors. I interviewed forum moderators for my thesis who prohibited ‘sourcing’ on their message boards and regularly edited, closed or removed discussions they believed were motivated by attracting potential sellers. An example would be a forum user posting that ‘isn’t it hard to find ecstasy in Perth at the moment’. If anyone in Perth had ecstasy to sell, they could send a private message to the OP offering their services. Although this was possible and likely occurred despite swift moderator action to remove those threads, most forum users did not use the internet to buy drugs. In a paper I presented at #comtech2011, forum users discussed their views on talking about drugs in public online forums and their strategies to avoid the risk of incriminating themselves. One popular strategy was to avoid all discussion of supply or dealing so as not to attract the attention of law enforcement who may be watching the forums. Most believed that law enforcement were after ‘dealers, not users’. I conducted those interviews 3 years ago in 2008. In 2011, the situation has shifted considerably with the arrival of Silk Road, an anonymous online marketplace where anything* can be bought or sold. Silk Road is accessible only to people who are using TOR anonymising software. TOR uses encryption to make it impossible for anyone to trace your IP address. The front page of Silk Road looks a lot like an Amazon or an Ebay. Goods and services for sale are categorised. Sellers receive ratings from buyers and comments about the quality of their products, how fast they ship, and the level of professionalism and discreteness of the transaction. Trust in sellers is built on reputation. Silk Road traders use the anonymous currency Bitcoin. This decentralised international currency operates through peer-to-peer technologies. It has an exchange and a lively forum of users. The possibilities of a non-government-controlled anonymous international currency are quite mind-boggling. The obvious possibility is being played out right now on Silk Road: buying and selling illegal products is now possible and may dramatically increase in the near future. What may stop an exponential increase in the use of anonymous online drug marketplaces is the hurdle of delivery. At the end of the transaction, the physical product still needs to be sent to the buyer. Sending products between countries allows Customs the opportunity to intercept packages and potentially attempt to arrest the would-be importer. Sending products within the same country may make arrest less likely. There are also fairly large barriers to entry for most ordinary people who might want to buy drugs online. Installing and using TOR, buying and using Bitcoins in a secure way, and taking the risk of fraud or arrest through package tracing from Customs may deter the majority of would-be users. In a recent example of the volatility of this new system, Bitcoin exchange Mt Gox was hacked, causing the currency to rapidly devalue. But for the minority who master these concerns and are willing to take the risk, Silk Road and its successors have forever changed how the internet can be used to source drugs. After all, buying drugs in the real world also involves considerable risk. For some, the online equivalent may prove more secure than trying to arrange a standard deal. The extent to which law enforcement can bring down a site like this is yet to be seen. Equally, the extent to which ordinary drug users will use this new technology is also unknown. Needless to say, if anonymous online drug markets do end up expanding into mainstream drug markets, they will pose a real challenge to existing drug laws and policies. All I can say is that I will be following Silk Road’s progress with great interest. * In this exchange from Silk Road’s founder, he notes that some goods/services are not tolerated due to their capacity to harm others and attract controversy. In this category, he includes pedophilia, hitmen and counterfeit currency. This blog has been re-posted with permission from Monica Barratt, for more of Monica’s work click here.